Sunset from her log cabin. Photo by Courtney Maum. MONTANA – One of the best trips my husband and I ever went on was to Montana in the summer of 2007. We started out in the Glacier Region and travelled down by car to Yellowstone Park. 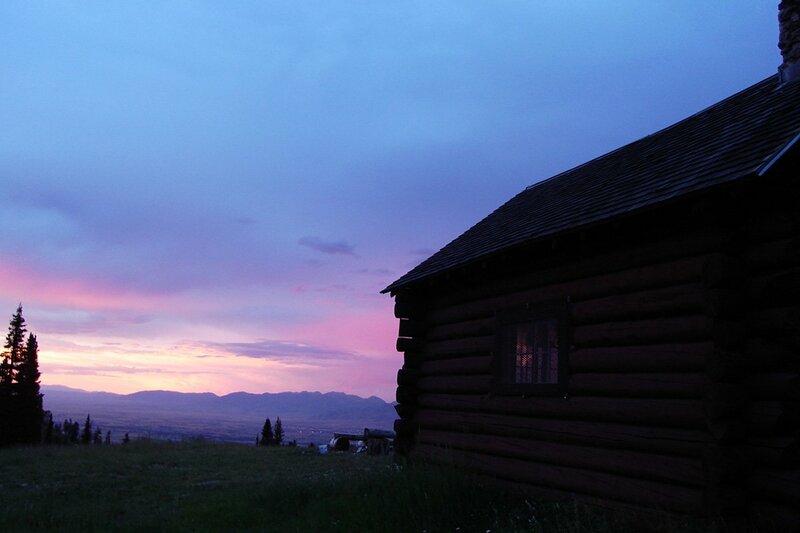 For both destinations, we used Montana's National Recreation Reservation Service to book different log cabins. Unheated, with only a lantern as electricity, each cabin came equipped a vintage wood stove, playing cards, and a canister of salt. One of the cabins was an actual fire lookout on top of a mountain. Perched on stilts, with walls made out of glass, the view was incomparable. For two days straight we had hummus sandwiches for lunch; dinner was corned beef out of a can on top of couscous, and red wine. We spent the days exploring the mountain range on foot, watching out for grizzly bears. All alone except for the marmots, it only took several hours for us to realize how much the "privilege" of electricity had actually stripped away from us. With nothing to do but tell each other stories, hike, nap, and sun, it was a perfect, blissful vacation. So good in fact, that we ended up moving out of Brooklyn, NY and into our current log cabin home — in The Berkshires — because of it. When the electricity goes out, we cook sausage links on top of our wood stove and recall Montana. Courtney is a fiction writer who likes make believe, jump rope, and Yorkshire Breakfast Tea. She travels for the creative repercussions.